Be the first to share your favorite memory, photo or story of Janelle. This memorial page is dedicated for family, friends and future generations to celebrate the life of their loved one. 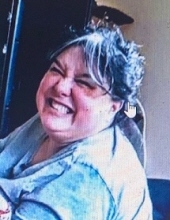 Beverly - Janelle L. (Burnham) Rathe 54, wife of John E. Rathe, died Wednesday, April 3, 2019 at the Lahey Medical Center in Burlington. Born and raised in Gloucester, she was the daughter of the late Gordon C. Jr. and Joan C. (Madruga) Burnham. She graduated from Gloucester High School and earned a Bachelor’s degree in culinary arts from the former Essex Agricultural and Technical School in Danvers. Janelle had been employed for sixteen years as a florist at Stop & Shop Grocery Store on Elliott Street in Beverly. In addition to her husband, she is survived by two daughters, Elizabeth Rathe of Beverly and Kate Soper of Beverly, two grandchildren, Tucker Rathe and Jaiyden Soper, a sister, Belinda Capriullo of Beverly, a brother, Donny Burnham of Gloucester and a nephew, Brayson Burnham. Her funeral service will be held graveside, at St. Mary’s Cemetery, 106 Brimbal Avenue, Beverly, Wednesday, April 10, 2019 at 10:00 a.m. Relatives and friends are invited to attend. Visiting hours at the Campbell Funeral Home, 525 Cabot Street, Beverly on Tuesday from 5 to 7 p.m. In lieu of flowers, expressions of sympathy may be made in her memory to the Jimmy Fund or the American Diabetes Association. Information, directions, condolences at www.campbellfuneral.com . To send flowers or a remembrance gift to the family of Janelle L. Rathe, please visit our Tribute Store. "Email Address" would like to share the life celebration of Janelle L. Rathe. Click on the "link" to go to share a favorite memory or leave a condolence message for the family.